By Gordon Frickers 61 x 91 cms (24″ x 36″), oils on canvas, commissioned, original sold. 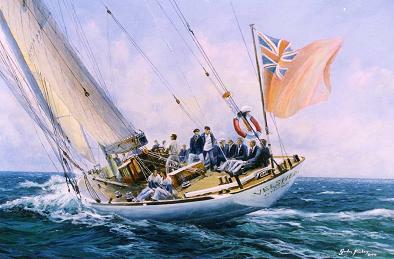 This painting was a commission, that turned into some fine sailing and a life long friendship. Produced to be presented as a retirement gift to the M.D. by CPC (United Kingdom) Limited / Best Foods Inc. The company regularly chartered Velsheda during Cowes Week Royal Regatta. A group of the directors were to be shown on her stern deck with the skipper and crew, each to be clearly identifiable, in effect, mini portraits.